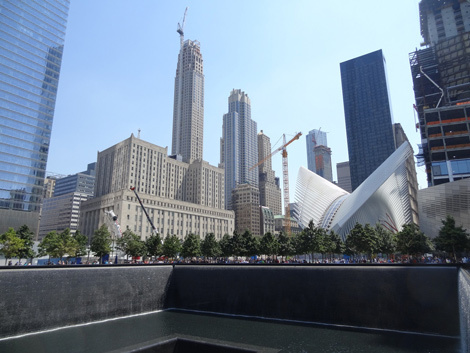 It may be known as the city that never sleeps, but New York certainly continues to add places where one can rest their head. 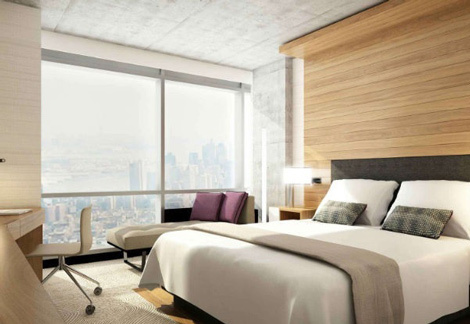 Hotels large or small, classic or contemporary, uptown or downtown – developments of every scale and style are in progress or in the pipeline. While most still aim for the busy streets of Manhattan, Brooklyn will also see a few more hotel openings over the next few years. Here are 14 hotels, either brand new or given a new lease on life, headed for the Big Apple. Marriott International will open its third Renaissance Hotel on West 35th Street in a matter of weeks, in between Bryant Park and Penn Station. Renaissance New York Midtown will have just shy of 350 rooms, meeting facilities and an Irish Pub called Rock and Reilly’s, which features a semi-covered outdoor patio. Having closed in September 2014 for a $175 million renovation, InterContinental The Barclay is now accepting reservations from April 21. Originally built by the Vanderbilt family in 1926, the hotel will reopen with 700 rooms and suites, a new Club Lounge, restaurant and bar, and extensive conference facilities. Listed for ‘spring 2016’ but without a full website as of now, The Williamsburg Hotel is due to arrive on Wythe Avenue in Brooklyn. Virtually next to the Wythe Hotel (somewhat of a pioneer back in 2012), The Williamsburg will have 150 rooms and an Italian restaurant run by Chef Adam Leonti. Pushed back another month compared to earlier this year (see news January 2016), The Beekman is now aiming to open on June 6. Incorporating the 1883 Temple Court, one of the first high-rises in the city, The Beekman will be Thompson Hotels’ third hotel in New York. The 287 rooms and suites come with high ceilings, aged oak floors and a craft cocktail table. NoMad (North of Madison Square Park) has seen a jump in hotel development in the last few years, and more is coming. 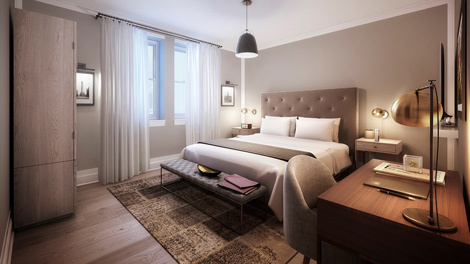 In June, Hotel Grand Union will open its 90 rooms and suites in a 1905 Beaux-Arts building on East 32nd Street. 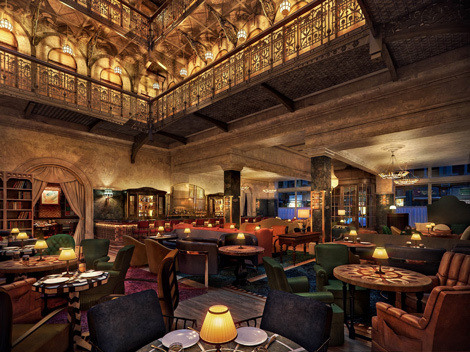 NoMad Kitchen serves breakfast, lunch and dinner, while there is also a lobby bar and (rooftop) lounge. Nearby, on East 30th Street, Sam Nazarian’s SLS Hotels should open SLS Park Avenue sometime in the summer. Originally predicted for 2013, the hotel worked its way through various opening dates in subsequent years to where it is today. When complete, it will have 190 rooms, ‘an exclusive rooftop experience’ and a restaurant overseen by José Andrés. In the meantime, barely a block away, the Martha Washington Hotel will become The Redbury New York, joining Nazarian’s Redbury Hotels in Hollywood and South Beach. Also with a fair number of missed opening dates under its belt is Tommie Hudson Square, the first hotel of the ‘lifestyle micro hotel brand’, part of Commune Hotels. 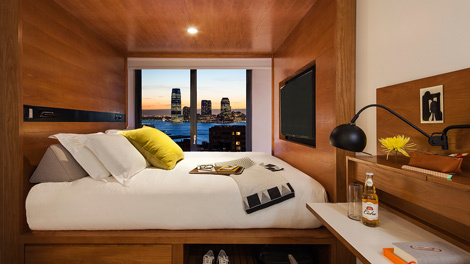 The 325-room hotel is one of three Tommie properties planned for Manhattan, all trying to woo the millennial traveller. The Hudson Square hotel will have a Harold’s Meat & Three American Eatery, a courtyard, a bar on the ground floor and – here as well – on the roof, as well as a 24-hr general store. Reservations are now live from August 1. In addition to Tommie, Commune is planning to open 50 Bowery – in Chinatown – at the end of September. A 22-story new build, it will be part of Commune’s Joie de Vivre hotels and have 225 rooms, a ground-floor Chinese restaurant and 19th floor bar with outdoor terrace and panoramic views. In the fall, Tim and Kit Kemp will expand their Firmdale Hotels portfolio with a second Manhattan property: the Whitby Hotel. On West 56th Street, the 16-story hotel will have 86 rooms and suites, a restaurant, library, bar, conservatory and 120-seat cinema. Like its siblings Crosby Street Hotel (on the street of the same name in Soho) and the Ham Yard Hotel (on the edge of London’s Soho), the Whitby will feature large warehouse-style windows and Kit Kemp’s signature style of bold prints, patterns and colours. By the end of the year, Four Seasons Hotels and Resorts will add a Robert A.M. Stern-designed property in lower Manhattan to its current I.M. 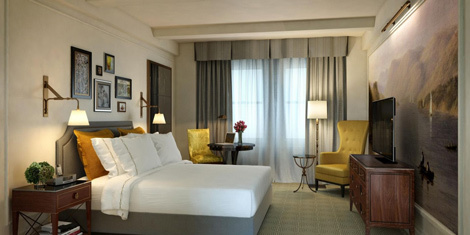 Pei-designed hotel on 57th Street (see news, March 13). Next to the Woolworth Building and overlooking the 9/11 memorial fountains, Four Seasons New York Downtown will have 185 rooms and suites with interiors by Yabu Pushelberg and the first Wolfgang Puck CUT restaurant on the East Coast. 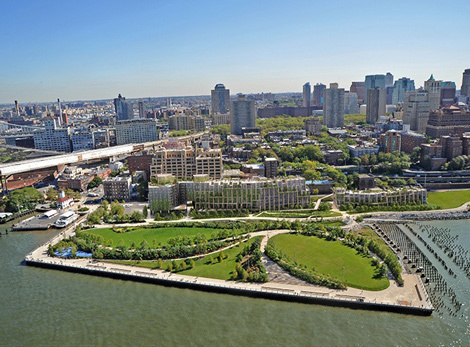 Around the same time, 1 Hotel Brooklyn Bridge should open a short hop across the East River. 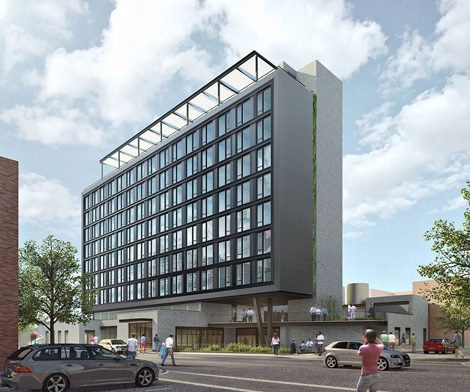 Joining 1 Hotel Central Park, which opened in summer 2015, the riverside property will have 194 hotel rooms, all with signature eco-conscious features like triple-filtered taps, Keetsa mattresses and organic cotton bedding. A tenth-floor rooftop bar and lounge will have direct views of lower Manhattan. Having crossed the Channel from the UK into Amsterdam (see news, February 20) and having started to build in Paris (see news, March 12), Hoxton Hotels is heading across the Atlantic in 2017. 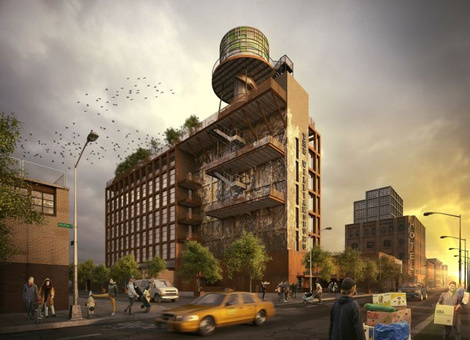 Once again on Wythe Avenue, The Hoxton Williamsburg will be on the site of the former Rosenwach factory, where many of the wooden water towers so familiar in New York’s skyline were made. There will be 175 rooms, along with a restaurant and meeting spaces run by Soho House Group. 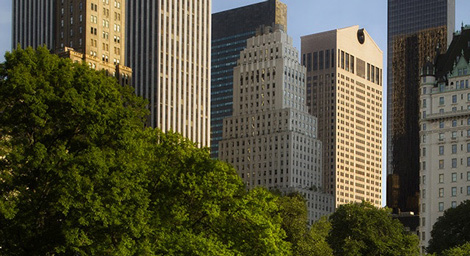 Having reopened The Lanesborough London (a St. Regis Hotel prior to its 18-month renovation), Oetker Collection will expand its small portfolio with a New York hotel in the former Sony building on Madison Avenue (see news, December 2015). Expected to open in the spring of 2018, the 170-room hotel will occupy eight floors in the building, along with a restaurant, bar, and spa with fitness centre and 25-metre swimming pool. Above the hotel will be 115 serviced residences. 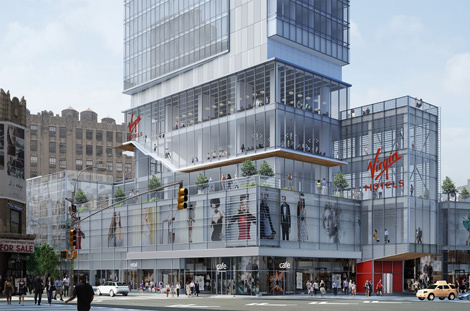 By then, Richard Branson’s Virgin Hotel New York will have had two and a half years to construct its future home on Broadway between 29th and 30th Street. The 39-story building broke ground in September 2015, with its sights set on an early 2018 opening. It will have 465 rooms and suites, with ‘distinct design’ compared to its Chicago sibling, which introduced concepts including the Dressing Room / Lounge, patented bed, mobile app LUCY, and social space The Commons Club (see news, January 2015). It will come as no surprise that there is more happening in New York than what is captured here. Having sold for an attention-grabbing $1.95 billion, the Waldorf-Astoria hotel will finally see an investment in its tired room product, with part of the hotel likely be converted to condominiums. EVEN Hotels, the health and fitness brand from InterContinental Hotels Group, should grow to three Manhattan hotels, while high-end fitness club Equinox will branch out into hotels with a 200-room property within the Hudson Yards development. 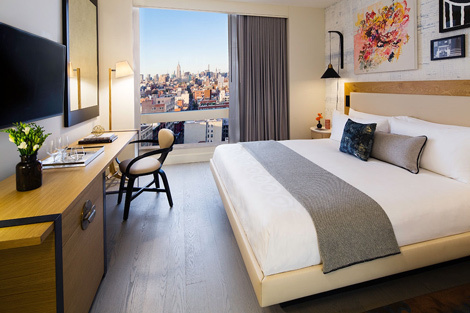 Regent Hotels, which has seen hotels from Boston to Bali and Phuket to Zagreb depart its fold, has pledged a return to the US, including a hotel in New York (see news, March 4).